This post was originally published 5 years ago, in March 2013. 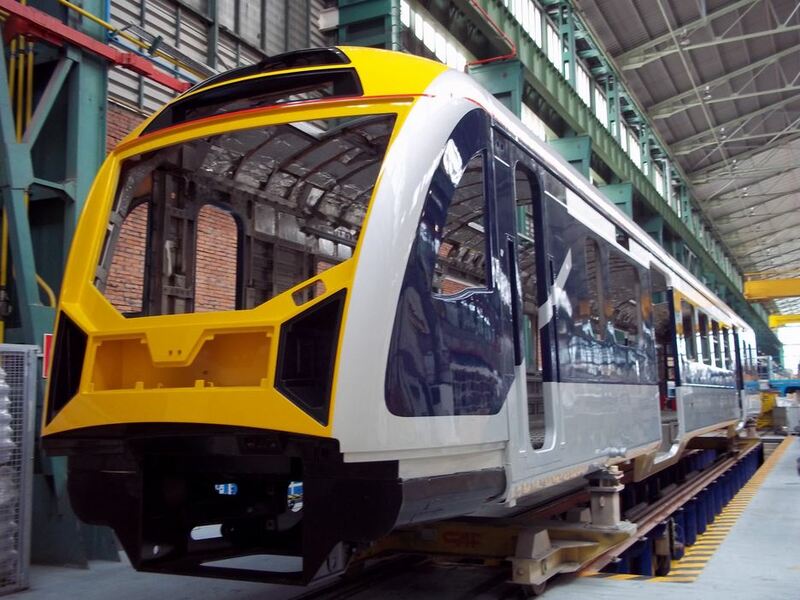 The first of what I’m sure will be our superb new electric trains is under construction in Spain. The body shell for the first of the carriages has been completed and have already taken a trip to the paint shop to get its colours with details like logo added later in the process. 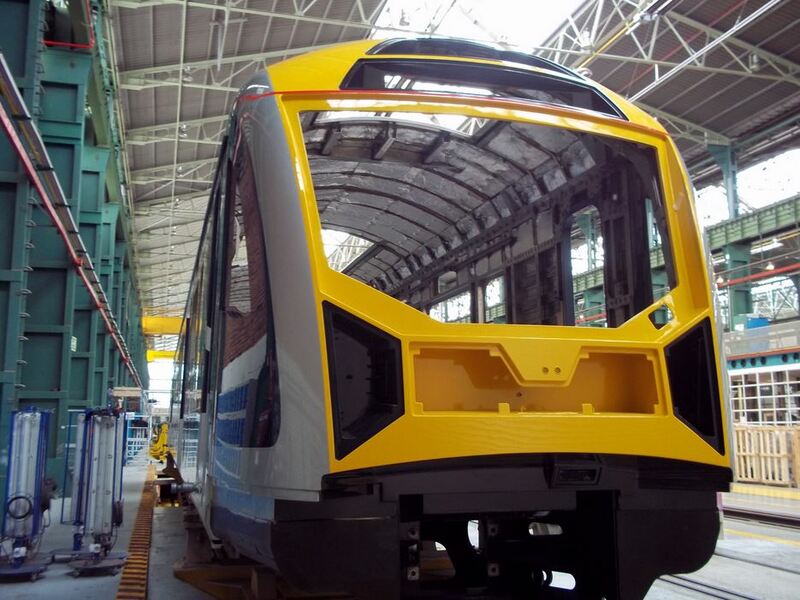 The train is now in the assembly process to get fitted out with all of its components which is expected to be finished in late April. It will then spend a few months in Spain going though initial testing before being loaded onto a ship to be transported here and will be delivered by late August. I am really looking forward to the arrival of this train. 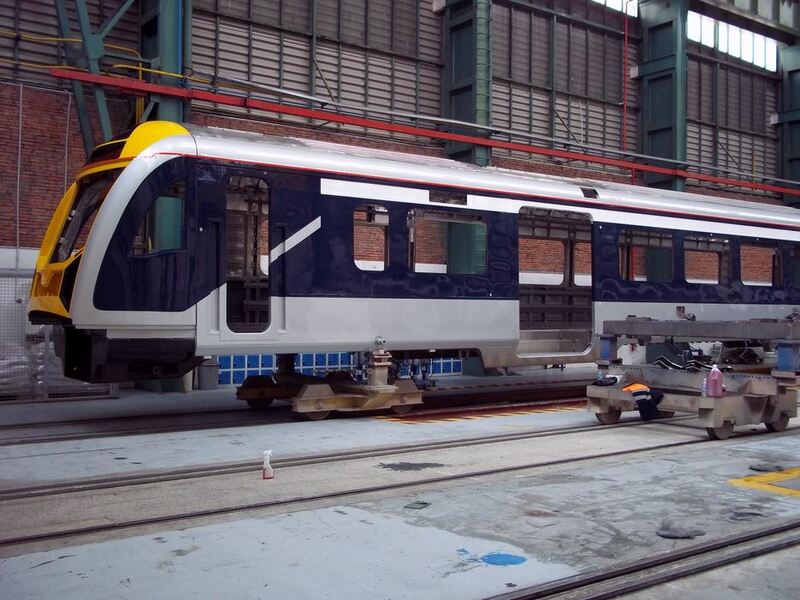 It will take some months to go though testing over here before going into service, likely early in the new year. Thanks to AT for providing the photos. If you want a reminder of what the final version is expected to look like, check out this post of the mock-up that we looked at last year. The mock-up is now in Motat where you can view it. I think the purpose of the yellow doors is to make them easier to spot for the visually impaired. So will the new EMUs will make less of a horrible screeching sound when they go around corners? Worse they make a horrible screeching sound when they brake coming into a station. My understanding was that Hillside was only ever able to produce running stock, not bodywork. Having said that, are Kiwi Bus Builders coach designers or do they just modify existing coaches? If they build from a raw chassis, perhaps building a train body would be something they could do. The issue with domestic production though, assuming we had the industrial capability, is cost. These foreign companies don’t help our economy, but they’re so much cheaper than local production and have the benefit of experience. KiwiRail’s scenic carriages (AK class) were built at Hillside. What would Hillside do once the EMU order was complete? They would have to put together a full production line and bring in expertise to fill what is a very small order for a train manufacturer. They built 17x excellent AK cars, just before the place closed down and future wagon orders were sourced from China. Steven Joyce’s mission accomplished, to kill off Hillside. There’s a little bit more specialisation involved in building an EMU, when compared with a carriage. There probably is, but there is no way starting from scratch to complete a small order would be anywhere near as cost effective as a large factory that pumps out EMUs by the thousands. Hillside should never have been closed as it served a useful purpose but it was never going to be specialising in EMUs for the tiny NZ market. Better still if it could be fitted with batteries, power bogie and controls then run as a railcar shuttle from huapai to swanson. Run a frequent bus service on this route – if that isn’t well supported, a rail service is likely a waste of scarce PT money (particularly if infrequent on an indirect route). Mock ups are for looks, not operational. Useful for developing/testing internal layouts etc. The mockup has completed that task. So what useful purpose could it now be used for. If its a proper ss bodyshell then I’d suggest a project, privately funded, perhaps university students project, to repurpose it into a battery powered running railcar. Thats an area NZ needs to develop some knowledge in, at least assist some engineering education. Then it may be of use to AT or other rail operators. We could use it to demonstrate longitudinal seating? Don’t we have longitudinal seating already? In the AMT cars.